The sizzling second novel in the gritty contemporary Sons of Steel Row series from the author of Dare to Run. Contains mature themes. Bruised and bloodied on Boston's mean streets, Chris O'Brien is reeling from the loss of his childhood best friend. But after barely escaping a hit placed on his head, Chris is desperate to live. A chance encounter leads him to the perfect safe haven—the home of a girl from his childhood, Molly Lachlan. Before he has fully considered what it would mean to involve her in his mess, he lets her take him home. For Molly, letting Chris into her house means also letting him into her life. 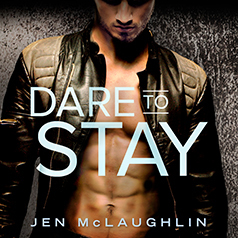 Danger and desperation are coming off of him like steam, and yet she can't bring herself to turn him away. His bad-boy charm always had a hold on her, but now there's a soulfulness and sorrow in him that she's never seen before. And despite the heart-stopping risk of helping him, she hopes against all reason that he'll stay . . .